The Nuclear AMRC has worked alongside Rolls-Royce to significantly reduce the time needed to produce a complex heat exchanger sub-assembly. The project focused on a baffle cage, a complex and precise arrangement of 5,000 six-metre tubes, all of which must be inserted through 11 plates and then expanded and welded into position. 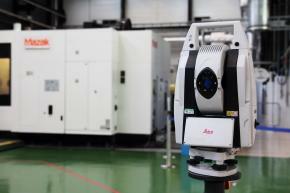 The team used the Nuclear AMRC’s Leica laser tracking system to create a real-time model of the whole assembly, allowing the position of each plate to be precisely mapped. 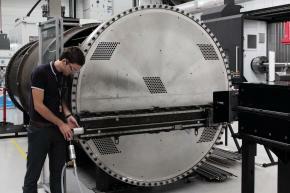 The process was developed on a full-size assembly in the Nuclear AMRC’s workshop. The centre’s engineers procured or manufactured all parts of the test assembly, and provided engineering support to develop assembly instructions and risk assessments. The team also worked with specialist design engineers at the Nuclear AMRC’s sister centre, the AMRC with Boeing, to create new assembly fixturing and devices to improve safety for the workers loading and positioning the plates. The baffle cage project will help Rolls-Royce achieve its strategic target of reducing its domestic civil new build manufacturing and engineering costs by around half. “Using this method, we are confident we can consistently cut by half the time needed for the process,” says Lobato. “Furthermore, ensuring that tube placement is right first time further reduces delays and eliminates the potential for re-work and the cost associated with it. This yields predictable and consistent lead times, which is of great benefit to Rolls-Royce because it enhances the level of service we are able to deliver to our customer. The project has shown that time savings well beyond Rolls-Royce’s original target can be achieved, says Nuclear AMRC projects director Alan McLelland. “Using these principles, we could reduce assembly time by up to 80 per cent across a range of heat exchanger assemblies,” he notes. The project was part of the civil nuclear Sharing in Growth programme, which aims to develop the UK manufacturing supply chain for the global civil nuclear market. The programme is part-funded by government through the Regional Growth Fund, and led by the Nuclear AMRC with support from Rolls-Royce and other industry leaders. As well as industry-led research and development, CNSIG includes intense business development for 10 key suppliers. The team is continuing to investigate innovative ways to improve the manufacturing process, including improved techniques to weld heat exchanger tubes to tubesheets, and the use of portable machine tools to produce features on the assembly’s end plates. For more on our latest R&D results and capabilities, download the new issue of our quarterly newsletter. Find out more about our metrology & inspection capabilities. Nuclear policy makers, experts and industry leaders discuss the new build market in the UK and worldwide. Speakers include key figures from nuclear new build programmes around the world, reactor providers, UK regulators, utility groups, and support organisations including the Nuclear AMRC. 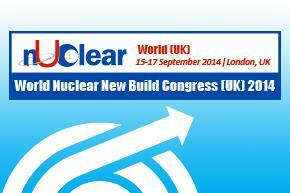 For more information and to register, go to the World Nuclear New Build Congress (UK) 2014 website. Former Westinghouse vice president Duncan Craig has joined the Fit For Nuclear team to help UK manufacturers meet the standards demanded by the industry’s top tier. Craig has over 35 years’ experience in the UK nuclear sector. The Fit For Nuclear (F4N) assessment allows manufacturing companies to test whether they are ready to enter the nuclear supply chain. Managed by the Nuclear AMRC, F4N lets companies measure their operations against the standards required to supply the nuclear industry, and take the necessary steps to close any gaps. Around 150 companies have completed the online F4N assessment over the past three years, with the majority receiving ongoing support and development from the Nuclear AMRC team. 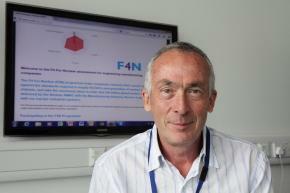 As part of the civil nuclear Sharing in Growth programme, backed by the Regional Growth Fund, F4N is now being enhanced and expanded with the aim of supporting 300 firms over the next two years. Craig’s role as nuclear specialist will include visiting companies to better understand their strengths and challenges, and developing follow-up plans to help them raise their performance. “One thing I’ve always enjoyed is going out into manufacturing businesses large and small,” he says. Craig joined BNFL in 1978 as an engineer and worked at Springfields for 25 years in a variety of roles. After leading a major skills programme, he was made responsible for all Magnox fuel production, then moved into the oxides area to lead the integration of four major plants into a single automated facility. He was then appointed site manager for Springfields, with responsibility for 2,500 staff. “One of the big focuses was performance improvement – how do we improve quality and reduce costs, because we were under constant price pressure from customers. We did a lot of process improvement and lean manufacturing, and were pretty successful,” he recalls. He then moved to Westinghouse to lead manufacturing improvements across the global fuels business, combining Toyota-style production systems with nuclear industry best practice. His last role before retirement was vice president for operations support for Europe, Middle East and Africa. Craig represented Westinghouse on the Nuclear AMRC’s programme board in the centre’s early days, and was keen to continue working with the centre – and with his former colleague Mike Tynan. Nuclear AMRC welding engineers have demonstrated the power of the centre’s giant new electron beam chamber by joining large steel cylinders in minutes rather than days. 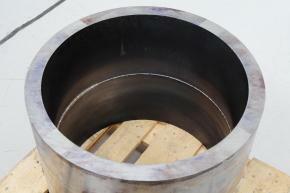 The test, designed to highlight the potential time savings of electron beam welding to industrial partners, involved two S355 carbon manganese steel pipes of 600mm diameter and 45mm wall thickness. Joining such cylinders with a weld as thick as the wall would take up to four days using conventional arc welding techniques, because of the need to apply multiple layers of weld and carry out repeated non-destructive testing (NDT) to guarantee the weld quality. Electron beam welding, by contrast, can join very thick metal sections with a single weld which needs just one final inspection. Nuclear AMRC engineers have achieved welds of up to 100mm thick in nuclear-grade steel using the small ProBeam K25 chamber. The centre’s new ProBeam K2000 chamber – believed to be the largest e-beam chamber available for research anywhere in the world, with a vacuum chamber volume of over 200m3 – completed the cylindrical weld in less than four minutes. The weld quality is at least as good as that of a traditional weld, notes Bernd Baufeld, power beam technology lead at the Nuclear AMRC. 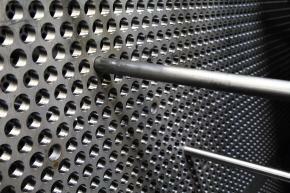 Nuclear AMRC welding and cladding R&D capabilities.